Panel-mounting, double-sided BNC connectors (also known as 'back-to-back' or 'bulkhead through-adapter'), designed for 12G 4K UHD applications. 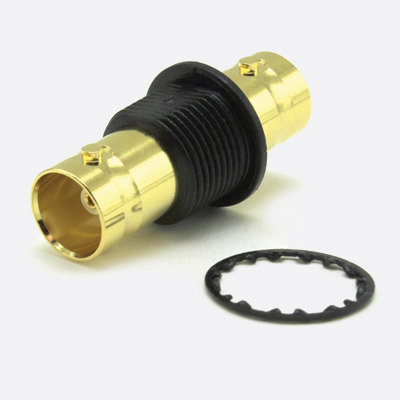 They have gold-plated beryllium-copper centre contacts for optimum mechanical performance. 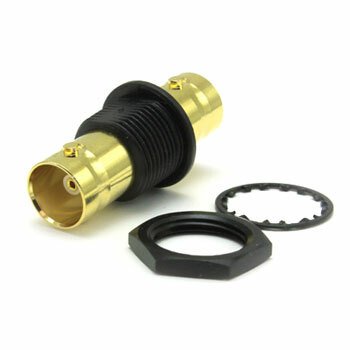 Connector bodies, nickel or gold plated, are insulated from the panel, and have a black mounting bush. 12G 4K UHD series back-to-back nickel plated panel connectors can be distinguished from the visually similar 3G version as they have a small groove around the body. Panel hole diameter 12.8mm. Body has anti-rotation flat, 11.8mm across body at flat.